Martial law provides a basis for restoring the maximum order on the streets of the country and a tough response to offenses of any scale, Ukraine's Prosecutor General Yuriy Lutsenko has said. "In the closed part of the meeting with security forces, I set the task to respond as strictly as possible to any violations of the law on the streets. 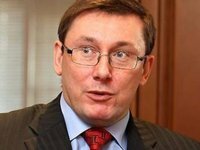 Starting from the banal use of obscene words in the presence of citizens, which, by the way, is an offense for which a specific punishment is provided, to violence and attacks on business or individual citizens," Lutsenko said at a briefing on Tuesday in Odesa. He said hooliganism has recently “fallen into a certain comfort zone,” since the police are busy investigating more serious crimes. “We agreed that it will be terminated,” Lutsenko said. "The introduction of martial law provides a good basis for establishing maximum order on the street now. Of course, no one will illegally detain people and throw them into some basements or subject to physical abuse, but the maximum qualification for offenses on the street will be used," the prosecutor general said, adding that the number of police patrols will be increased. As earlier reported, On November 26, Ukrainian President Petro Poroshenko signed an executive order introducing martial law until 2 p.m. on December 26. The Verkhovna Rada endorsed the president's order on the same day. It was published in the parliamentary newspaper on November 28.